The Cleveland Browns hold two first-round draft picks in the upcoming NFL Draft. While many expect the Browns to use one of those picks on a quarterback, history shows that drafting a quarterback – especially one in the first round – has been an exercise in futility for the Browns. Since joining the NFL in 1950, the Browns have drafted six quarterbacks in the first round and none of them have worked out. In Part One of our series on those six quarterbacks, we looked at Harry Agganis, the team’s first-round selection in 1952. Today we focus on Bobby Garrett, the first Stanford quarterback taken No. 1 overall in the draft. The Cleveland Browns closed out the 1953 NFL season by losing the NFL Championship Game to the Detroit Lions by the score of 17-16. The loss was the Browns third consecutive in the title game, as a roster that dominated the All-American Football Conference and the NFL was starting to age. At that time in NFL history, rather than award the No. 1 overall pick to the league’s worst team – the Chicago Cardinals – the league held a lottery and, despite going 11-1 and appearing in the league title game, the Browns won the first overall selection. Armed with that pick, Cleveland head coach Paul Brown went in search for a successor to Otto Graham, knowing that the 32-year-old Graham might only have a few years left in the league. The draft that year was not a particularly strong one – no Hall of Famers were selected and only six players picked in the first four rounds would go on to be Pro Bowlers, but if there was a safe pick it appeared to be Stanford quarterback Bobby Garrett. Garrett was an All-American at Stanford and, as a senior, earned the W.J. Voit Memorial Trophy as the West Coast’s most outstanding player. That season, he led Stanford to a 21-20 upset of fourth-ranked UCLA, throwing three touchdowns and kicking all the extra points. He capped off the year by being named MVP of the 1954 Hula Bowl. That would turn out to be the last highlight of Garrett’s football career. On Jan. 28, 1954, the Browns made Garrett the No. 1 overall pick in the draft; that much is a fact. What came next is a matter of debate depending on who you talk to. Not wanting to wait for Garrett, the Browns traded him – before training camp had even started – to Green Bay. Garrett appeared in nine games for the Packers, completing 15-of-30 passes for 143 yards and an interception. He then spent two years in the military before the Packers traded him in August of 1957 – back to Cleveland of all places. The Browns sent six players to Green Bay – quarterback Babe Parilli, end Carlton Massey, halfbacks John Petitbon and Billy Kinard, tackle John Macerelli and center Sam Palumbo – for Garrett and linebacker Roger Zatkoff. This is where the story becomes a bit more opaque. According to an article on Stanford’s website, the return to Cleveland finished off any chance of Garrett having an NFL career because Paul Brown could not deal with the fact that Garrett had a speech impediment – he stuttered. The criticism became so relentless that, during a preseason trip to the West Coast, Garrett walked into a coaches meeting and told Brown that he was heading home for good. That decision surprised Brown and, according to Garrett’s son, Bill, led the Hall-of-Fame coach to spread word around the league that Garrett couldn’t cut it because of his stutter. It was the Browns, not Garrett, that came out on the short end of the deal, according to Wiggin. As for the Browns, they were entering the beginning of the end of Paul Brown’s dynasty. Graham had retired after the 1955 season after leading the team to 10 consecutive championship games, winning seven of them. In 1956 Tommy O’Connell, George Ratterman and Parilli shared the starting position as the Browns went 5-7 – the franchise’s first losing season. The Browns would make it back to the NFL Championship Game in 1957, the final title game appearance for Paul Brown, as O’Connell shared the quarterback role with Milt Plum. The Browns would lose the championship that year to Detroit by the score of 59-14. As for Garrett, he would go on to work for Sears Roebuck and Co. until his death from a heart attack in 1987. 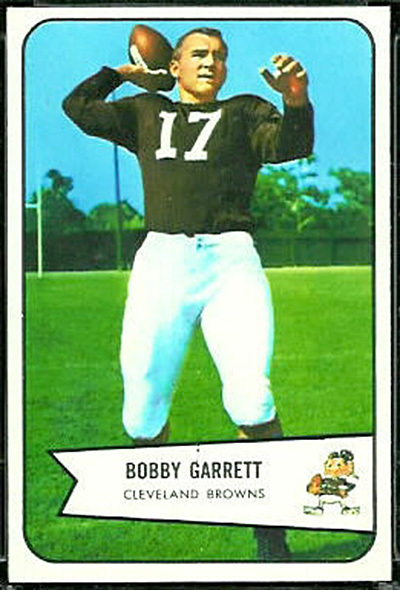 Bobby Garrett, the first Stanford quarterback drafted No. 1 overall, was out of football at the age of 25. And the Browns would not draft another quarterback in the first round until 1970.